Well, I’m still reading Romeo & Juliet. I want to read it through a second time before I start posting my thoughts here (and it ends up I do need to glance at a lot of the footnotes again on the second reading—that darn Mercutio!). I’ve been waylaid by the Olympics and little boys running around my house and also by my lingering bronchitis that allows me to read for exactly 20 seconds between hacking sessions. Anyway, I’ll hopefully be writing about R&J later this week. 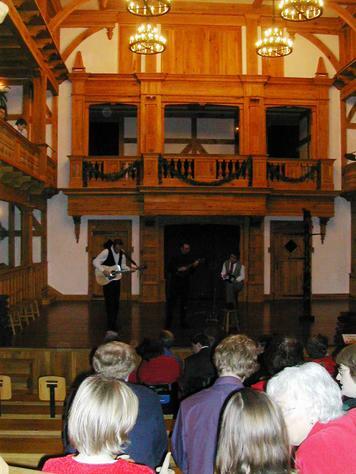 I have seen live performances of many of Shakespeare’s plays. My mom took me as a kid. I plan to blog about that soon. It was a really awesome experience and made me into an arts lover at a young age. So, I had that experience of seeing Shakespeare performed live long before I started reading the plays. Not that I still remember the story lines or have specific memories of the performances, but the seed was planted. And I would love to see Shakespeare performed now. It’s on my to-do list! In the meantime, I plan to watch film versions before I read each play. It’s not the same as seeing live performances, but it helps. As the notes in my Pelican Shakespeare editions emphasize, Shakespeare’s only intention was performance, and the texts that exist of the plays are in many ways an afterthought. Plays weren’t considered literature back then, and the folios (early printed versions of the plays) were produced after Shakespeare’s death. He was not in the business of writing books; he was producing live performances. So, while I find Shakespeare a wonderful read, it’s really fun to see a good live production. 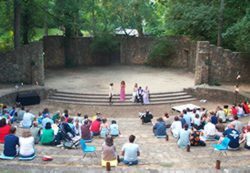 I have a nice memory of seeing A Midsummer Night’s Dream performed about 15 years ago at the outdoor Forest Theater (literally in the woods) on the University of North Carolina campus in Chapel Hill. It was a magical, perfect setting for a magical, perfect play! Seeing Shakespeare performed live can really change your perspective about his work. I think there’s a general cultural attitude that Shakespeare is hoity-toity stuff. I usually get glazed looks from many of my friends when I bring up this blog. People are just not interested in Shakespeare because they have an image in their mind that it’s “high culture” or difficult material or ?? I’m not always sure I understand what the barriers are. Maybe it’s because I had that experience of seeing the live performances at a young age. I did not develop that prejudice about What Shakespeare Is. It is a lot of dirty jokes and funny situations. It is really intense dramas that I think touch you differently at different times in your life. And really, just a lot of great stories and interesting characters and always a beautiful way with words. If you get into it, it can become as complex as you want it to be—obviously there are Shakespeare scholars that delve into the nuances of all these plays. That’s part of the beauty: you can return to them time and again and they don’t get stale. There is something new to enjoy each time you revisit a play. Not to be clichéd, but they are timeless. Anyway, I don’t have that “Shakespeare is Hoity” mentality running in the background. The cartoon in my last post is pretty much how I view the young men of Verona walking around cruisin’ for a bruisin’ in Romeo and Juliet. They start the play by basically flipping the bird at each other and picking a fight! It’s not high-class stuff! So, go see the plays if you can! It’s a great idea to see them performed live before you read them. And I’m really intrigued by the Blackfriars Playhouse at the American Shakespeare Center in Staunton, Virginia. They produce the plays following the basic principles of Renaissance theatrical production—engaging the audience, quick pacing, minimal sets, etc. I have never seen a play done this way and it sounds fantastic!